Streamline Parker Duofold Long Junior fountain pen in Moderne Black and Pearl with the later Deluxe trim. The Duofold Deluxe has triple cap bands. The longer Junior is 1/4" longer than its shorter counterpart but maintains the same trim. 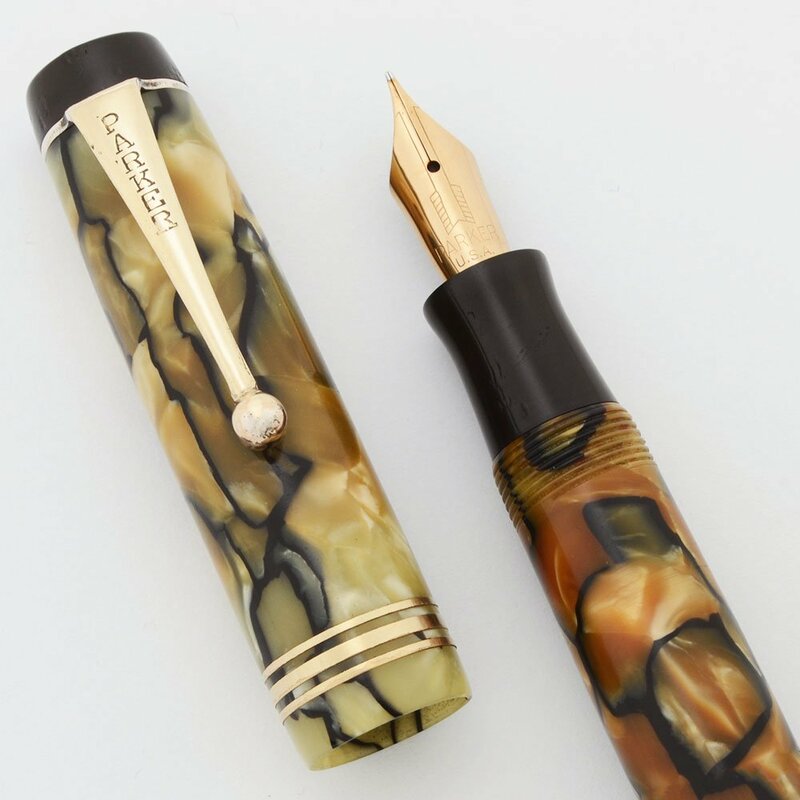 The pen has a fine vacumatic nib and a restored button filler mechanism. Excellent condition. 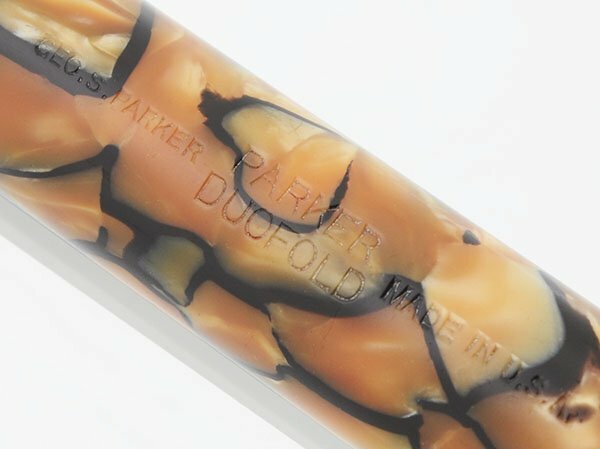 Product Name Parker Duofold Jr Deluxe, Streamline. The three cap bands makes it Deluxe. Manufacturer and Year Parker, USA -- 1930s, this particular triple cap band was introduced in 1932. Filling System The fountain pen is a button filler. It has been restored with a new sac. Color Moderne Black and Pearl color. It started as a pearlescent marble mix with black veins but has ambered. It is now a yellow orange. The cap has two narrow bands on either side of a wider band in the middle. Nib Fine 14k nib. It is smooth and springy. The nib is a replacement from the Parker Vacumatic era. Condition Excellent condition with no cracks. The barrel is more ambered than the cap but it's still a nice color. The pearl components are translucent. The barrel imprint is clear. The cap piece has a few bite marks. The section has a few small tool marks. The "R" on the Parker clip is a bit difficult to read and there is some brassing on the trim. Overall the pen looks very good and is not personalized and has no dings or major scratches. It has been fully restored and is working well.